To get myself motivated, I'm going to try to read all these books before or by February 29th so I can start March without any leftovers in the TBR. Anyone want to join me and try to read through most or all of your TBR by the end of the month? Toss your name in comments if you do. No prize involved, I'm afraid, but it could be fun to see who can successful slay their TBR in a week. Anything Considered and Bella Tuscany fantastic, but make me want to head to France and Italy. Bill Bryson always good and waiting for my turn on the library list to read. City of Dark Magic a great read. Loved it. I'm joining in with my stack! I will! I actually started this at the beginning of the year, and am amazed at how much I've read so far. Not sure how many I still have to go..... especially if I include all my e-books. No way can I make that goal. My TBR pile is huge! Good luck though. 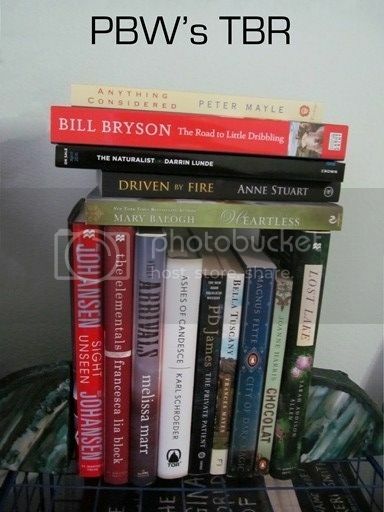 My TBR is a couple hundred books... that's the bad thing about ebooks, they take up a lot less room on the TBR pile. I'm almost done with book 27 since January 1st. Does that count for anything? LOL.